If you have ever taken a stroll through a market in southeast Asia, you most probably have already sighted this huge green fruit covered with pyramidal bumps. It is actually pretty difficult to miss it: as it is often too heavy to transport without a caddy and it is a tedious job to separate the fruit flesh from the rest. The jackfruit is the largest tree-borne fruit in the world, with fruits being up to a meter long and weighting up to some 40 kilograms. Each fruit pod contains over 100-200 big round brown seeds, looking more or less like gigantic hazelnuts, dispersed into a woody center. Their juicy and pear-shaped membrane is the edible fruit part. The flavor of the ripe fruit flesh is something between pineapple, mango, and banana, while the flesh texture can often be a bit chewy. Freshly extracted jackfruit flesh is best enjoyed right after being separated and/or purchased. The sweet-acidic fruit pieces start quickly fermenting and, therefore, should be eaten within 24 hours (or put that box of cleaned fruit flesh directly in the fridge if you have not managed to finish it in one go). Different sellers have different habits, some do remove the inside of the seed pods (fruit sacks) others don’t, so watch out for the round seeds or simply check before eating. Fruit chips from the flesh are a fantastic snack which may be found in lots of Asian supermarkets in Europe. Jackfruit seeds are a real treat too. They may be enjoyed boiled, grilled or fried. 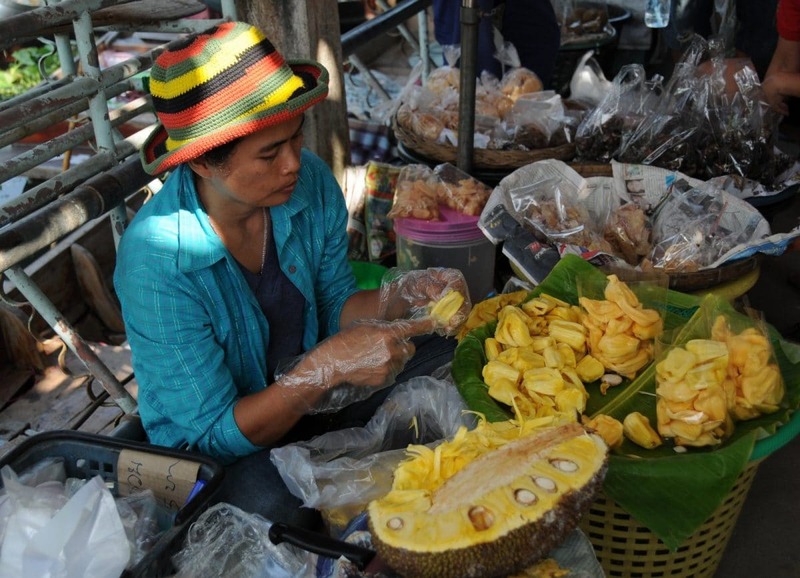 The seeds of the jackfruit are very rich in protein, potassium, calcium, and iron, but unfortunately are not sold that often as a street finger food. Same is valid here, store in cool place if you are in a place with high temperatures and humidity. You should select a jackfruit that gives away to pressure and has already developed some dark spots on it. The fruit should be fragrant already – i.e. before you have even cut into it. 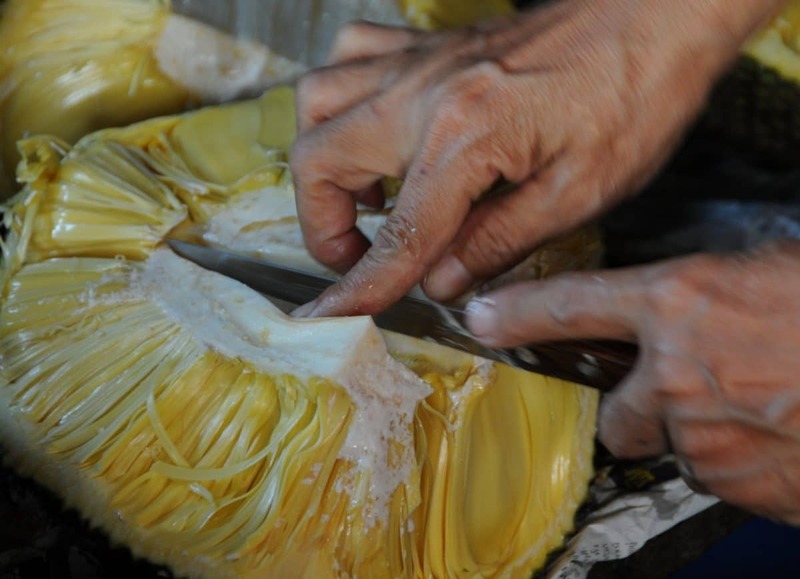 Jackfruit has a sticky latex inside (unless you happen to get one that is perfectly ripe), so you will want to protect your surfaces and oil your knife blade and hands (or wear gloves) to keep that stickiness from taking over. Lots of countries, like Thailand, Sri Lanka, and India, use the green jackfruit and its seeds instead of meat in curry dishes, BBQ, and other local specialties. Before the fruit gets ripe, they are collected and the flesh is cut in pieces and soaked in salt water. The taste of the end result is reported to be similar to a mix of artichoke-courgette flavours. So next time your are touring the southeast-Asian corner of the world don’t miss the chance to try this local exotic gourmet-fruit. Last but not least, in Bangladesh the jackfruit is the national fruit. There it is often considered the second most grown tree after the mango, as next to the fruit all other parts of the tree can also be used. The green leaves are a good source of animal food, while the bark has an orange colour that was traditionally used as a dye for monk’s robes. 2 Responses to "How to Eat: Jackfruit"
What an interesting post! Love the close up at the end….it looks stringy. I’ll look like an expert when I get the chance to try!